The US dollar has a lot going for it. The economy is solid with a tax-cut tailwind and a central bank that's eager to hike. Year-to-date, it's up against everything but the yen. 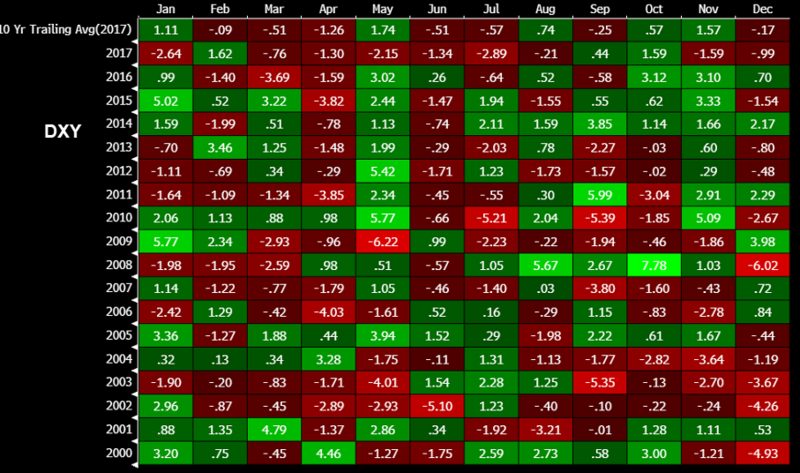 However, June isn't a great month for the dollar. The Dollar Index has fallen in 9 of the past 11 Junes with an average decline in the past decade of -0.51%. That makes it the third-worst month on the calendar. Ultimately, I'm a bit wary of this trade. The Fed is hinting to some changes to forward guidance on June 13 that may be seen as hawkish. On the flipside, the market is far too complacent about the likelihood of a trade war and how it might hurt the US dollar, even if risk aversion rises.